Welcome to the WSRS Members Area. To access these links on this page, you will need a valid WSRS members' username and password the same credentials you use to join the society which are included in your confirmation membership email. Members can check their membership details by clicking on "My detials" at the bottom of the page. 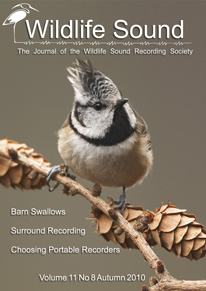 Wildlife Sound Journal, Spring edition out now (members only). See what is inside this edition (for everyone). 50 years of the WSRS A brief history of how the society was formed and some images over that past 50 years of the socity's activities, including the 50th anniversary Members' day. Subscription renewal and or amend your membership or contact details, (if you are a member you will need to login to the site). 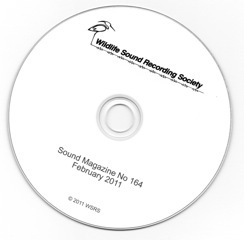 If you wish to be come a member of the Wildlife Sound Recording Society you can subscribe on the Join WSRS page. Members forum to exchange news and views and ask questions with other members of WSRS. To post to the Members' Forum you will need to sign up if you use the same credentials as your WSRS membership login, once you have registered it will for your own individual username at the forum - your joining details will be sent to you via email. Members can read the using the WSRS members area password. Sound Magazine; Members can now download the latest edition on the Sound Magazine as well as make comments on the recordings. The current Sound Magazine is SM193. Self-help Guides "An introduction to Sound Recording (updated 2013) and "Software Based Sound Editing"
WSRS Management Documents; constitution, past competition results, The Officers, Officers meeting minutes. How to get the best out of the WSRS website. My Details renew your subscription, amend your contact details. To be able to access additional content and features, Journals, Sound Magazines, Forum, newsletters etc, please login using your WSRS username and password. If you have forgotten your username or password, please select reset, by selecting the appropriate "Forgot" option below. NB: You will be lock out after 4 attempts. If you are not a member of Wildlife Sound Recording Society, why not join? Go to the Membership menu and select Join WSRS.